Look! It's Rebecca Black. On a Friday. Because she had a song called 'Friday!". I've used that joke before, but it's doubly funny today. Because today is Black Friday. Get it? 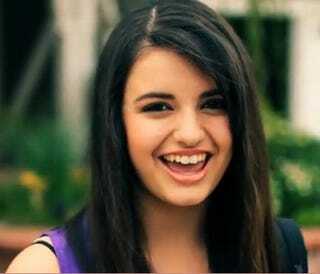 Rebecca Black, who had a song called 'Friday! ', featured on a Friday, which happens to be Black Friday! I'm so clever it makes my cuticles hurt. I'm going to keep this short, because It's late. I was at my sisters house to have Thanksgiving diner with my sister, her husband and a couple of their friends and their baby. I wish I had a picture of baby Clyde. His dad ate a turkey thigh, and after, they gave the bone to Clyde to chew on. it was pretty cute. A 9 month old gnawing on a fairly good sized bone. He found it very amusing. He also discovered he likes sweet potatoes. Anyway, I stayed later than I had planned, so I'm short of time. So I'm dipping into my bag of quick and dirty oddities for todays post. If you multiply 111,111,111 by 111,111,111 you get 12,345,678,987,654,321. I suppose it's not really odd, because, well....math. But, it is kind of cool. And slightly odd when you think about it. 9 ones times 9 ones makes 1 through 9 in ascending and descending order. Also, if you are, or know of anyone who is 46 years old, then the population of the world has doubled in their lifetime. And, people think the planet is running out of space for all the people. Well, if you take every person alive right now and put them all in Texas, the population density would be less than that of New York City. If you moved all 7,237,568,000 people in the world, (as of June 2014), to Texas, there would be 10, 395 people per square kilometer. Compare that to New York Citys 10,725 people per square kilometer. In 1942, during the Battle of Stalingrad, the Germans took control of a railway station one day. The Russians immediately counterattacked and took the station back. The Germans attacked again and re-took it. The Russians re-re-took it. The Germans re-re-re-took it. And this went on for 6 hours. At the end of the fighting, when the Germans finally gave up, the train station changed hands 14 times. And the Russians 13th Guards Division, which had started the day with 10,000 men, ended the day with just 320 able to continue fighting. Well....thats about enough for you today. Actually, I could keep going, but I'm tired. So, I'm going to bed.